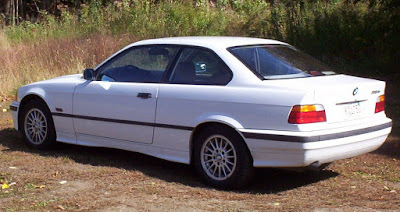 I sold my 1995 E36 BMW last week. When I told the people close to me what I had done, they reacted with sympathy. One said that it must have been like ending a relationship. In many ways my relationship with that car was a lot like some of the best relationships I've had with people. In our minds, we all have an image / description of our perfect mate. For the most part, we spend time seeking out people that fit our image and description. Every once in awhile however, you encounter someone who doesn't fit that mold. They walk into a room or pass you on the street and you're instantly drawn to them. You have no idea why. They just have that "something." That's what it was like with the BMW. I like dark green or red cars. I like 4 door sedans or hatchbacks. A white 2 door coupe was not anywhere on my list of desirable cars. Back in 1997 I was driving a Saab 9000. I bought it a few year earlier at a place called Northeast Motors in North Hampton, NH. It was a perfectly nice car. It was reliable, comfortable and somewhat entertaining. It was a green and, of course, it was a 4 door. I was in New Hampshire one weekend in 1997. I decided to take a drive past Northeast Motors. I honestly wasn't looking for a new car. I just wanted to see what cool / interesting cars they had on the lot. In the front row was their typical collection of Audis, Saabs and Volvos. Just past them, sitting by itself, was the BMW. I was instantly drawn to it. I stopped. The salesman who sold me the Saab, Niles, still worked there. He recognized me and the car. "What's up with that BMW? ", I asked. "Just took it in. ", he replied. "We haven't even cleaned it yet." "Can I take it for a drive?" I asked."Sure. I'll get the keys and a plate." I drove it for about 20 minutes. That was about 19 minutes and 50 seconds more than I needed to drive it to know that I wanted it. Niles is the type of car salesman you dream about. (If you dream about car salesman, I guess.) Low key and knowledgeable. No pressure. "What do you think?" he asked. "I don't know, let me think about it." "You have my number. ", he said. "Call me if you have any questions." And I did think about it. In fact, for the next 24 hours it was all I thought about. It was like that person with the "something." It was like being attracted to a short, blue-eyed, blonde. It made no sense. My "perfect person" is supposed to be a tall, brown-eyed, brunette. I called Niles the next day. "I want it." I told him. "Take the Saab in trade and arrange it with the bank so the payments are no more per month than I'm paying now for the Saab." Twenty minutes later he called me back. "Done. ", he said. "I'll fax you the paperwork for your approval." I picked it up the next day. My then significant-other - a real life tall, brown eyed, brunette - was surprised to see it. "I thought you hate white cars. I thought you only like 4 door cars. You'll grow tired of it in a couple of years." she said. "You're right. I'll probably just keep it for a year or two and then trade it in on something else. ", I replied. My significant-other and I split up two years later. The BMW stayed around for another 15 years and 200,000+ miles. I never grew tired of it. For all of those 15 years it was a faithful companion. There were times, like there are in human relationships, when I'd get pissed off at it and swear we were done. During a heavy snowstorm I spent a night sleeping on the hardwood floor of my office at the radio station I worked at. AWD Audis, Subarus and lesser FWD cars were cruising through the snow effortlessly, yet I couldn't get the BMW up the small parking lot incline and into the street. I swore I was going to sell it the next day. I didn't. Like I do with any human I love, I made some concessions and sacrificed a little to keep it around. I bought a Jeep to drive in the snow. For 15 years it was like that. A few fights now and then, but many, many, many more good times. The cold reality is that the BMW is not a human. Last October a large tree branch fell through its rear window during a freak snowstorm. It was the beginning of the end. I looked around for another car, but instead replaced the window. From that moment on - as if it was telling me it was time for it to leave - little things started going wrong. The exhaust broke. The steering rack, which had been leaking a little for awhile, started gushing power steering fluid. The clutch throw out bearing went from humming to growling. The brakes went bad. The headliner started falling down. The driver's side window regulator broke. Twice. The CD player grabbed a Tom Petty CD and wouldn't give it up. (I really like Tom Petty. Just not all day / every day.) Bulbs burnt out. The list of little things seemed endless. If it were a human I would have spent every waking hour and every cent I had to keep it alive and keep it around. It wasn't a human, however. I needed to look at the cold, hard financial reality. It was time for it to go. It will live on for awhile. I sold it to a guy in Connecticut. He works at a garage and can use the tools and lift after hours. He was going to replace whatever is needed to make it safe and use it as a commuter car for a little while. I sure hope he likes Tom Petty.